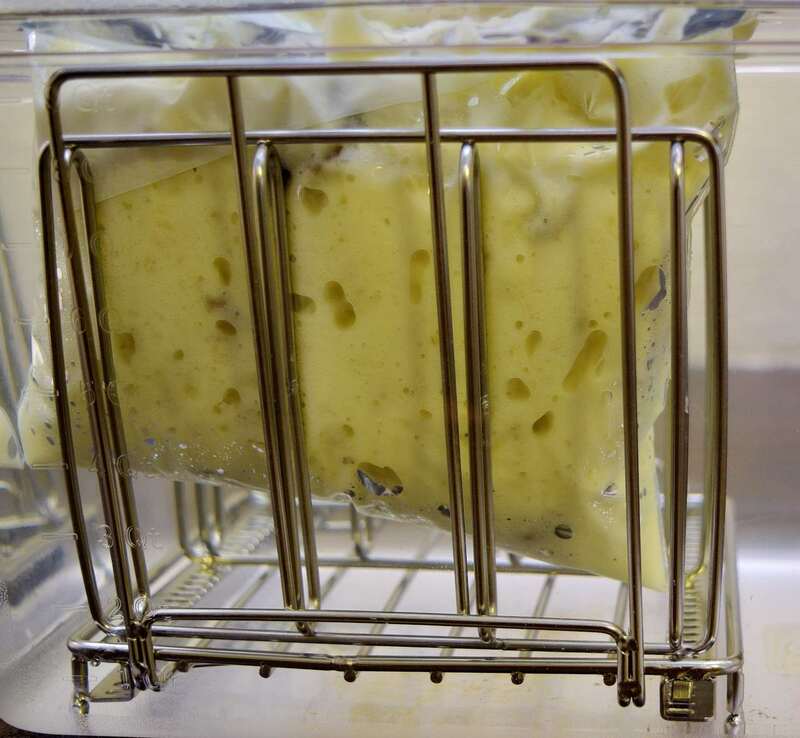 Sous vide need not be limited to the preparation of proteins. Many vegetables and starches benefit from the methodology. Potatoes, Russet, 1 lb/450 g.
Sweet butter, 3 oz/90 g.
Cream or milk, 0.25 cup/50 ml. Chicken bones from dismembering 1-2 chickens. Carrots, 1 each, cut into fourths (do not peel). Onions, 1 each medium, cut into quarters (do not peel). Flour, 2 dry oz (5 Tablespoons)/60 g.
Cream or milk, 0.5 cup/100 ml. Heat rated sous vide bags, 2 each. Ziploc 1 gallon freezer bags 2 each. Potato ricer. or Kitchenaid type mixer with paddle attachment. Stockpot, at least 3 quart. 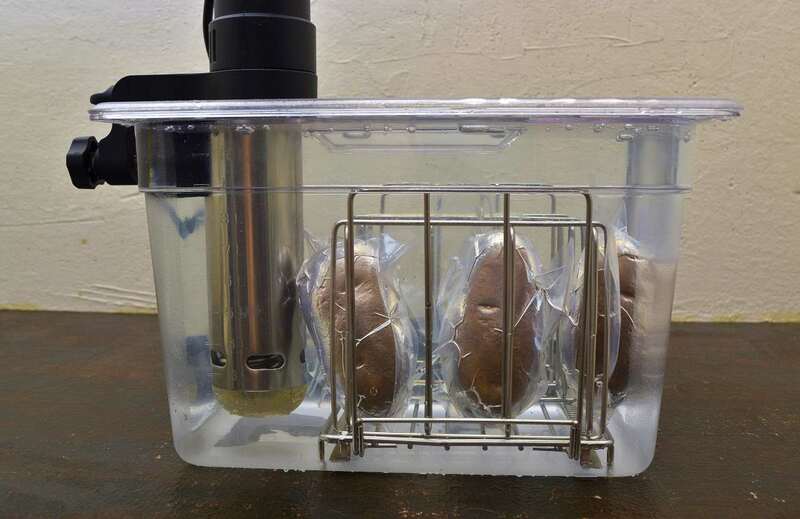 Seal the potatoes in vacuum pouches. A Ziploc Gallon Freezer bag can also be used. You can seal the bag and make sure it stands upright in a rack “just in case,” or even hang the opening over the edge of the Lipavi vessel and secure with the lid. Finish filling the vessel all the way to the top so the lid assures that the potatoes are fully submerged. Remove the potatoes from the bath and drain. If you push them through the ricer, there is no need to peel. If you use the mixer, you must peel them first. Mix in the salt, butter, and milk in that order. Serve or return to the bag. Seal or drape it over the edge of the container and keep it warm in the bath until service. Put a Ziploc one gallon freezer bag in a 2 quart pitcher. Fold the opening over the rim. Add the chicken bones, carrot, celery, onion and 1 quart/1 liter water to the bag. Lift out the bag and lower into the sous vide bath. As it slowly begins to sink, add the remaining quart of water to the bag and seal the bag. Use a rack to help the bag stand up so that there is no pressure on the zipper. Process for a minimum of 2 hours, or up to as long is convenient for YOU! The stock can be held at this temperature for at least 12 hours. When the time is elapsed (or when YOU are ready! ), put the colander over the stock pot. Place the bag of stock in the colander. DO NOT OPEN THE ZIPPER. Use a sharp knife to poke a hole in the bottom of the bag and the stock will drain out. Doing this will keep the carcass and vegetables in the bag which you can then discard as is. This saves a lot of mess. Whatever fat was in the stock tends to cling to the solid ingredients, so skimming the stock is usually unnecessary. Strain through a moistened paper towel or coffee filter into an appropriate container. Moistening the paper towel prevents the stock from clinging to the towel itself. 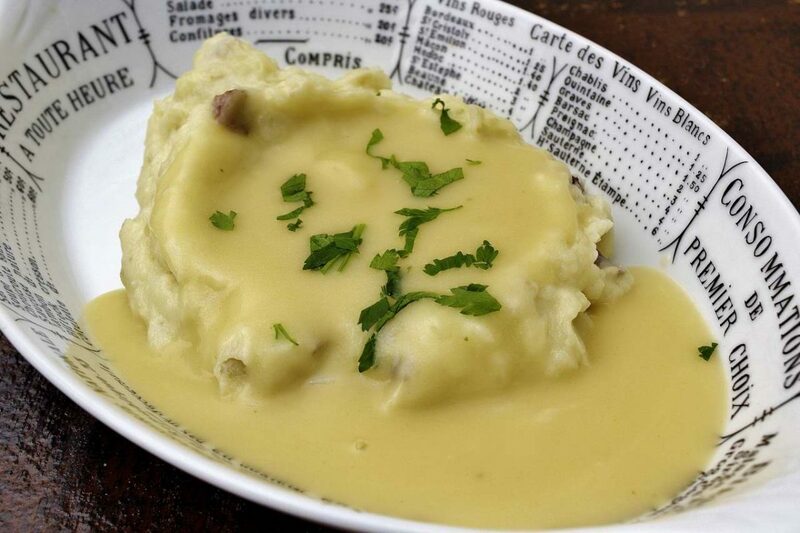 Set aside while you make the roux for the gravy. Rinse out the pot, return to the stove and melt the butter on low heat. Add the flour to the butter and use a wooden spoon to stir until dissolved–this is a roux. Increase heat slightly, add half of the warm stock, and stir slowly with the whisk. The gravy will begin to thicken and boil almost immediately. Do not worry about lumps at this stage. Add the rest of the stock and continue to stir slowly. Do not “whip” the sauce–this can actually damage the emulsion. Use the whisk to remove all the roux from the bottom of the pot. Add salt to taste–usually about 2 teaspoons. 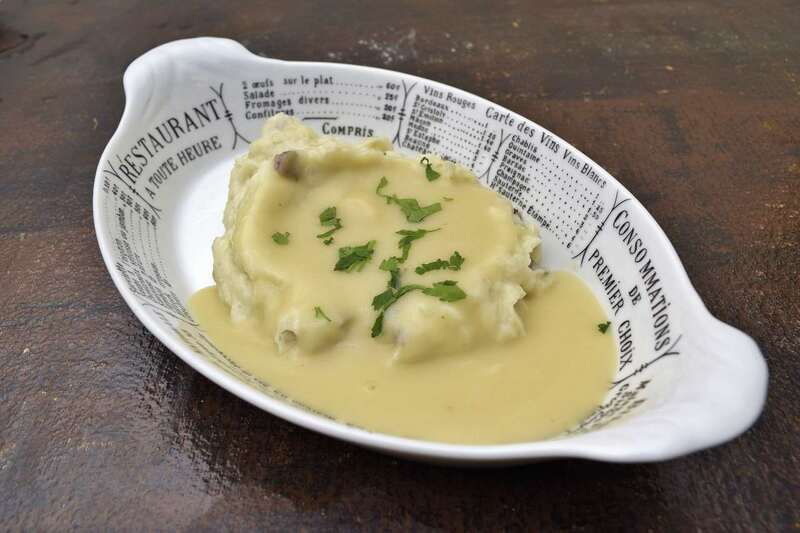 There is no shame in using a little chicken bouillon in the sauce instead of the salt–concentrated chicken flavoring has been around for a long time. Knorr makes a pretty good one. A little goes a long way. Add a pinch of cayenne pepper because ground black pepper is visible and white pepper is not particularly common. Simmer for five minutes. Check for thickness and add a little water if necessary. Roux can be temperamental. 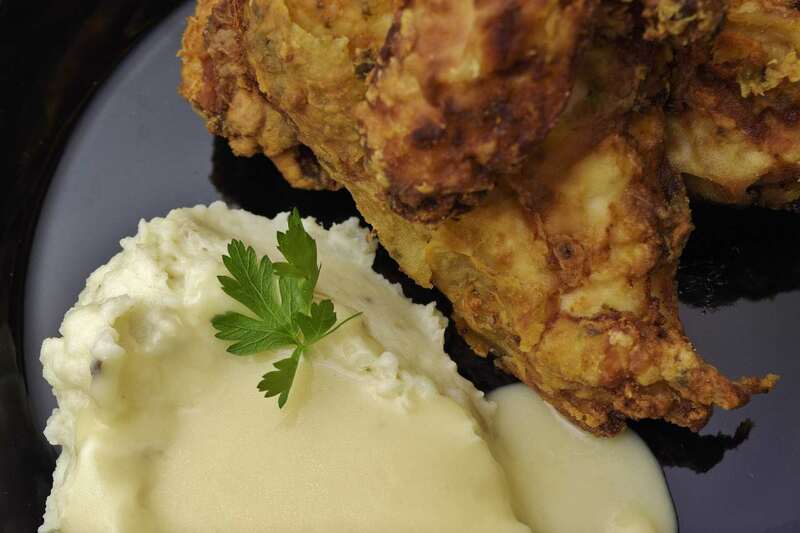 If the sauce is too thin, dissolve 1 Tablespoon of corn starch in 2 oz/50 ml of water. Add a little at a time to the simmering stock while you slowly stir with the whisk. Corn starch thickens immediately and at a lower temperature than flour, so be judicious in the amount that you add–cornstarch has twice the thickening power of flour. Pour the gravy through a strainer and push any lumps through with the wooden spoon. Taste and serve or stage into a Ziploc 1 quart freezer bag and keep warm in the bath set to 140F or above. Seal the bag or just drape the top over the edge of the vessel and secure with the lid. The gravy is behind the potatoes–I can usually manage to seal the bag, and Lipavi racks keep everything standing upright properly. Good gear. 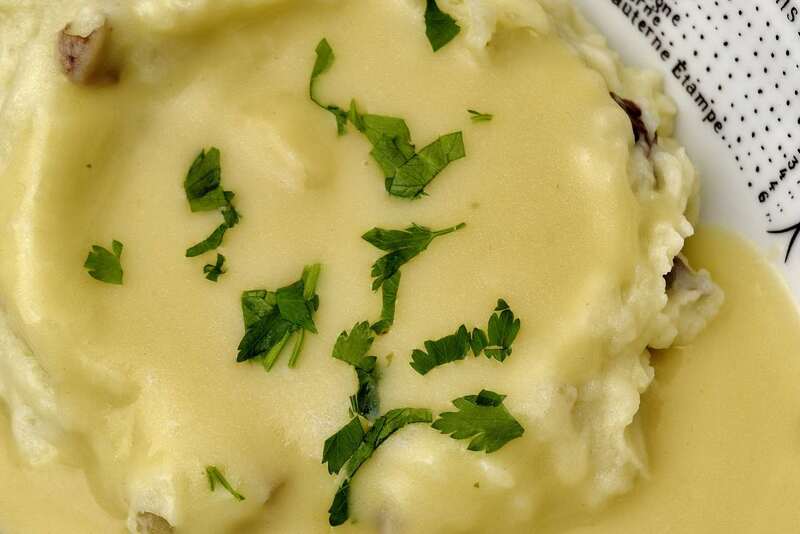 Mashed potatoes and chicken stock can clutter up your stove top and are messy to make. Timing their production can complicate your whole multi-tasked meal preparation. 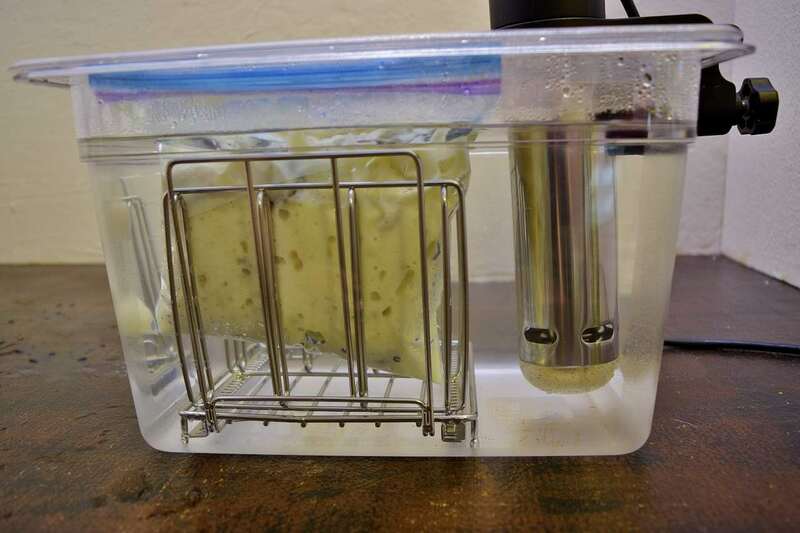 Using sous vide and a tried and true strategy to avoid the necessity of hiring a professional dishwasher will not only give you an outstanding product, but less overall cleanup as well.